I haven’t been making homemade cheesecakes for very long. Whenever we had cheesecake years ago for dessert, I would buy a mix, the one that has the crust, the filling, and the topping. To me homemade cheesecake just was too much work. When my daughters were getting older and starting to bake, Krista decided that she would like to make a homemade cheesecake. She found a recipe that she liked and she created a delicious cheesecake. I think it was the first time that a cheesecake from scratch was ever baked in the oven at our house. So when I saw my young daughter making a dessert that I thought was too much work for me, I knew I would have to try making one also. From the day that I made my first homemade cheesecake I have never bought a box mix again. I have fallen in love with making cheesecakes and they are so much more tastier than the ones that come in a box. When I am making a cheesecake I always make sure that I make it the day before I am going to serve it. I am not sure why, but I think they taste better if they have time to chill in the refrigerator for 24 hours. I made a cheesecake last weekend and wanted to try a new flavor for me. 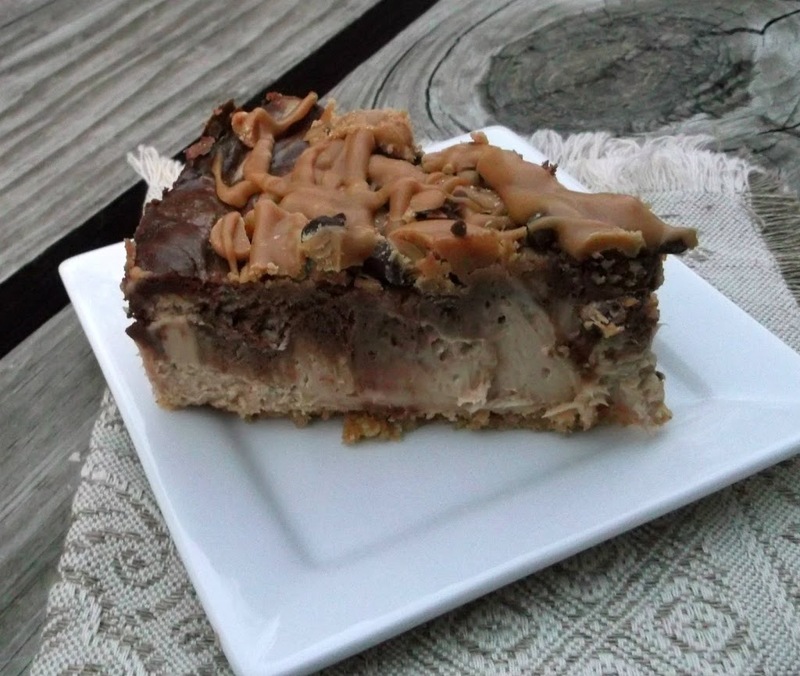 I decided upon chocolate and peanut butter cheesecake. I love the combination of chocolate and peanut butter; they seem to be made for each other. The dessert turned out dense and rich, just how I like my cheesecakes. I chopped a little bit of peanut butter chips and milk chocolate chips with a drizzle of melted peanut butter chips on top to enhance the flavor of chocolate and peanut butter. Needless to say the cheesecake was a hit with the family, well at least for the ones that like peanut butter. Use your favorite crust for this cheesecake. I used a graham cracker crust. 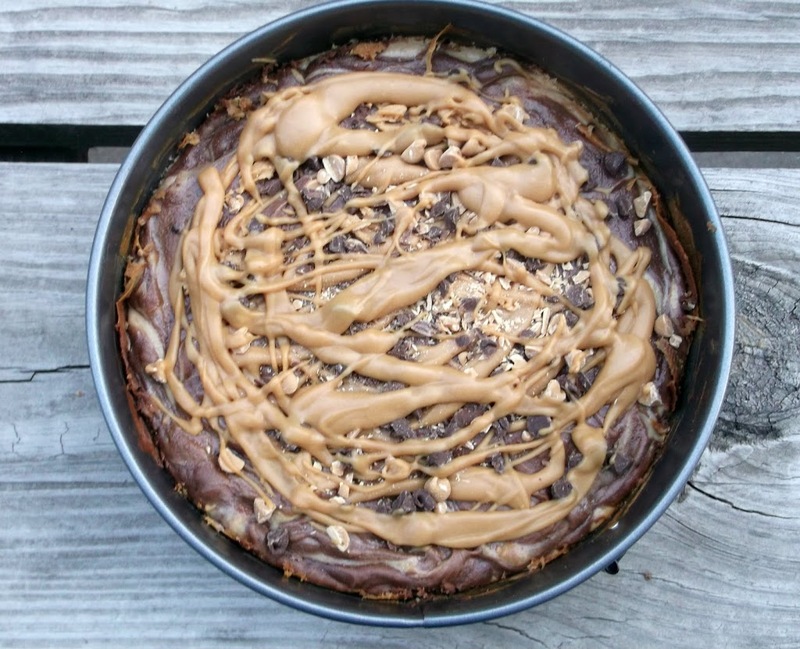 Bake cheesecake in a 9-inch springform pan. Beat cream cheese and sugar in large bowl with an electric mixer on medium speed until well blended. Add sour cream and vanilla; mix well. Add eggs, one at a time, beating on low after each egg, just until well blended. Remove one cup of the cheesecake batter and set aside. To the remaining cheesecake batter add the creamy peanut butter and blend well. Pour the peanut butter batter into the prepared crust. To the one cup of cheesecake batter that was set aside blend in the melted chocolate. Once the chocolate is blended take a teaspoon and spoon heaping teaspoons of the chocolate all over the top of the peanut butter batter. Once this is completed take a knife and swirl the chocolate batter into the peanut butter batter, until the spoonful of the chocolate batter is all swirled in. Place a baking dish half filled with water in the oven on the shelf below the cheesecake. Bake 45 to 50 minutes or until the center is almost set. Turn off oven and open door until oven is cooled down, remove cheesecake and continue to cool completely. Once cooled cover with tin foil and set in refrigerator for overnight. Before serving top with chopped milk chocolate chips and peanut butter chips. You can also melt peanut butter chips in microwave, stirring frequently and add enough cream to make the constituency desired for drizzling over the peanut butter chips and milk chocolate chips. It looks mouth watering delicious! My favorite combo in a cheesecake! Heavenly. I’d do anything for a slice right now! Great looking cheesecake! And I know it has tremendous flavor – how could it not with those wonderful ingredients, including chocolate and peanut butter, one of my favorite combos! Good recipe, good post – thanks. Absolutely delicious! 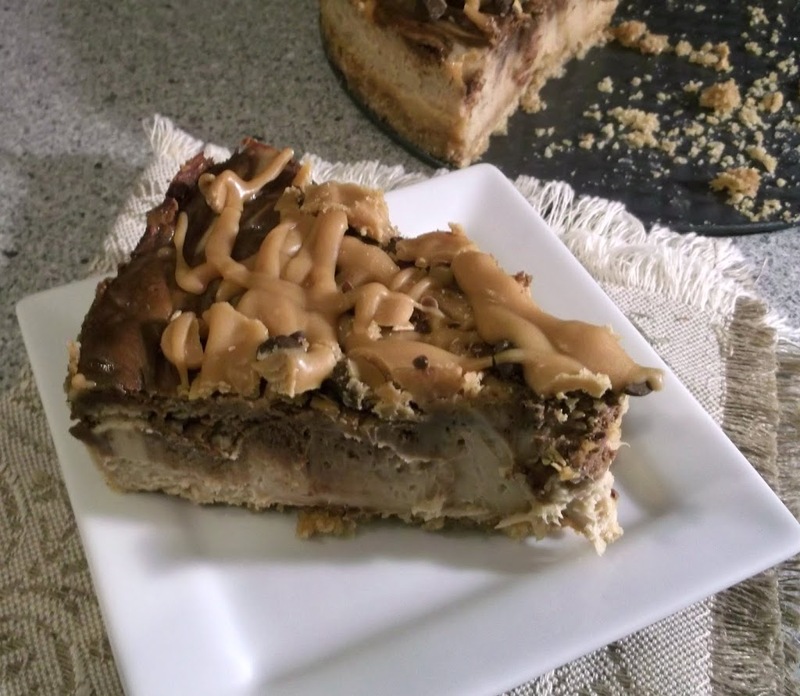 Chocolate & peanut butter – yummy! Oh, I am absolutely obsessed with chocolate!! And cheesecakes….yes I love them too….so this combination looks divine! YUM.